Remember paper drinking straws? Why does it look like there are drinking straws coming out of the bottom of the coil? Of course it's hookup wire, but my wire was covered in green rubber and didn't look anything like that. What is that black stuff dripping down the coil? Is the coil hollow or does it have a shiny top? Questions I asked myself as a kid. A clearer picture is on the right. 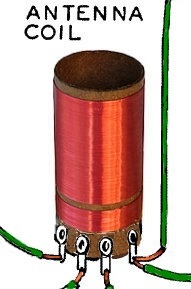 This particular coil is one and one eighth inches in diameter. 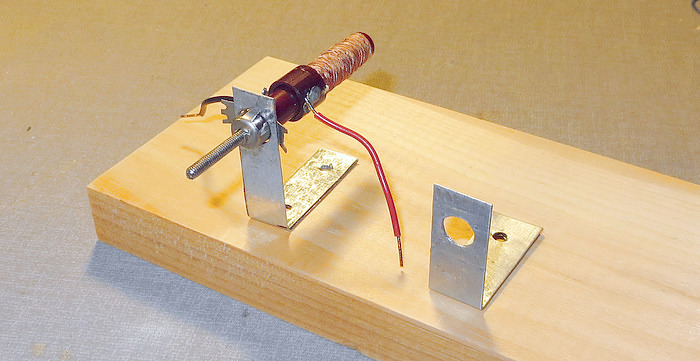 The primary coil is 130 turns of #28 gauge wire. The antenna - ground portion is 30 turns #28 gauge wire about 1/8" from the primary. 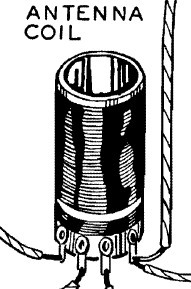 The original coil in the Morgan book was probably smaller, with smaller gauge wire. On page 50 of "The Boy's Second Book of Radio and Electronics," Morgan shows us a "corrugated glass insulator suitable for supporting a 50 to 75-foot receiving antenna." But what IS it? In 1966 I looked and looked at this picture and couldn't figure it out. This is how they are used. They look important! Well, you need those things on the antenna wire if you want the radio to work, right? I didn't know what they were but I looked around the house till I found something with a hole in each end. Then I hooked it up as above. You can see that the way I connected the insulator has rendered the antenna wire completely USELESS. This is what I used: an ERECTOR SET part. It had a hole in each end and it was flat, just like the picture in the book! 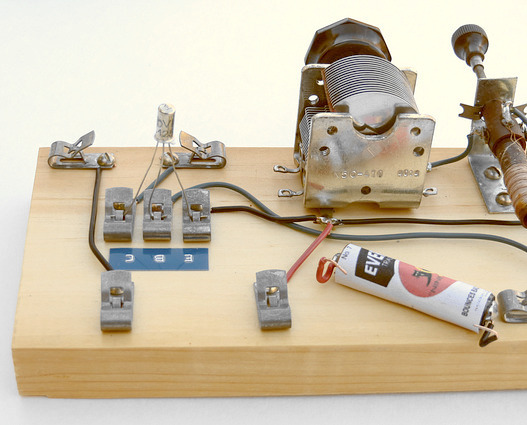 In my ignorance I had used a conductor as an insulator, but I had also stripped the insulation from the wires to match the pictures in the book. I had broken and then reconnected the antenna and was completely oblivious to it. This is one version of what a "corrugated glass insulator" actually looks like. This one is 3 inches long and an inch in diameter. From its appearance, it had held up someone's antenna for years. Thankfully, I didn't have one of these as a kid or I would have broken my antenna with it. The next year I realized that I had merely made a lousy connection with the Erector Set part and removed it, splicing the wire back together. By the way, there is a reason the insulator is corrugated. Though it is physically THREE inches long, an electrical current traveling across the surface would have to travel FOUR inches. In a case where the insulator becomes wet or dirty (or both) this increases its resistance. Fat chance finding the exact coils to make the two Morgan sets. 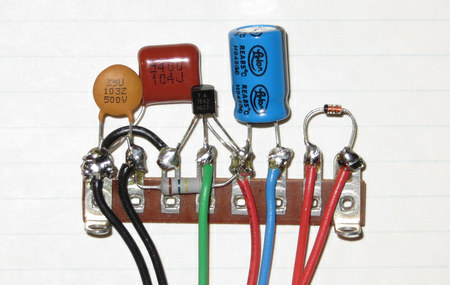 Above are the Miller 6300 and 2002 coils from 1966. 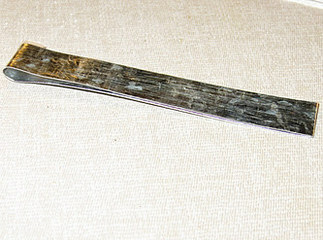 However, there IS a source for New Old Stock equivalents. They can be purchased from Peebles Originals. I wrote to Mike Peebles and he agreed to be listed as a source of these coils, but they are not in his online catalog so you have to ask him for them via email or phone call. Expect to pay TEN TIMES what they cost in the 1960s, and it's still a deal. 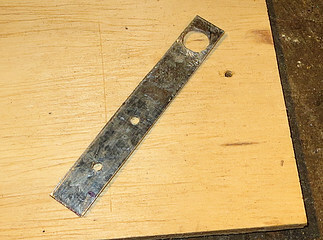 This is a scrap piece of roof flashing. It can be cut with heavy scissors. I cut a 1/2" strip, placed a piece of double-stick tape on half the strip, then folded it over. 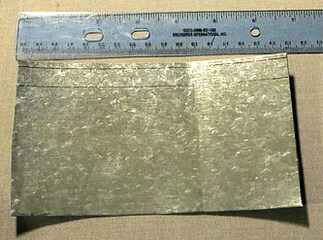 The fold was flattened with a hammer. 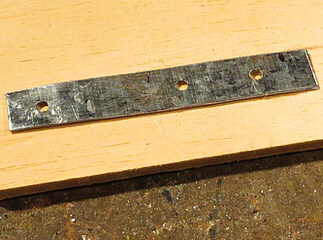 A 1/8" hole was drilled near the fold, and two more holes were drilled for the mounting screws. I tried to go up in drill bit size in the left photo, but the bit grabbed the metal. So instead of a drill bit, I placed a round tapered file in the drill chuck and reamed out the hole. The bracket was bent 90° and the excess was cut off the bottom. 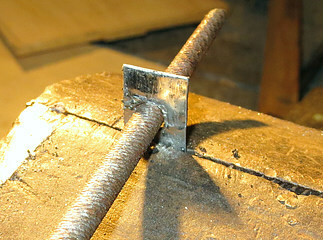 Two home made brackets. They don't look too bad. They'll both be used further down the page. 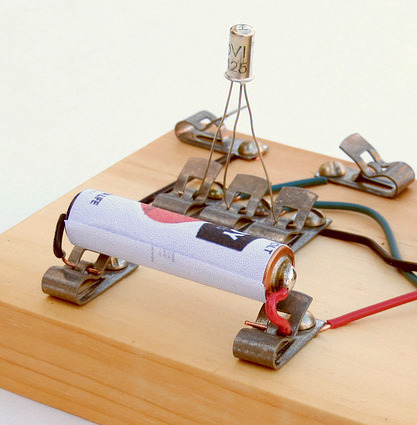 This was how I made a "battery holder" in 1966. It was a quick way to mount a battery using Fahnestock clips. 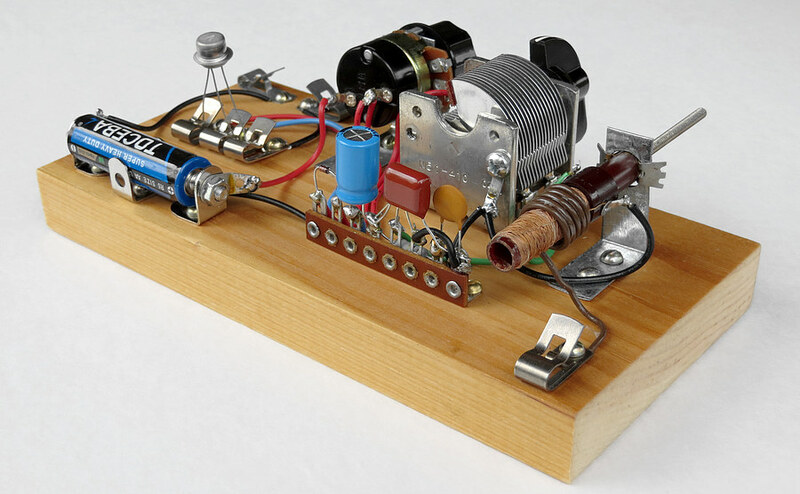 The battery is dedicated to the radio and when you have to replace it, the soldering gun needs to come out. 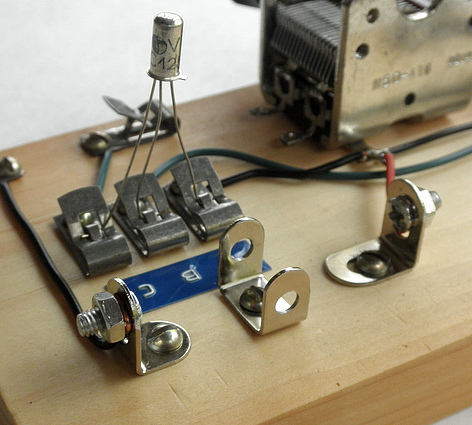 Back on page 3 you may have noticed Morgan also soldered wires to his battery. This battery holder was made with "Erector Set" type parts that were purchased at the dollar store. It works well, the battery "snaps" in. 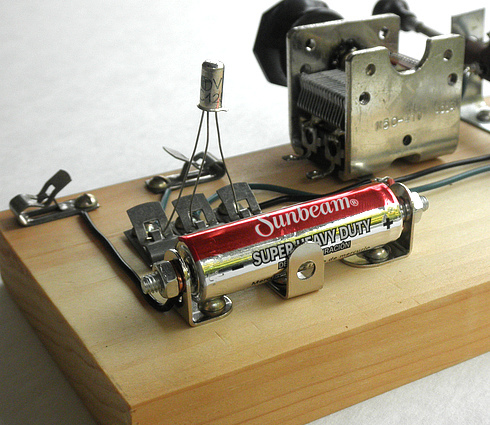 By the way, you can make the radio a lot louder by using two batteries in series to make 3 volts. 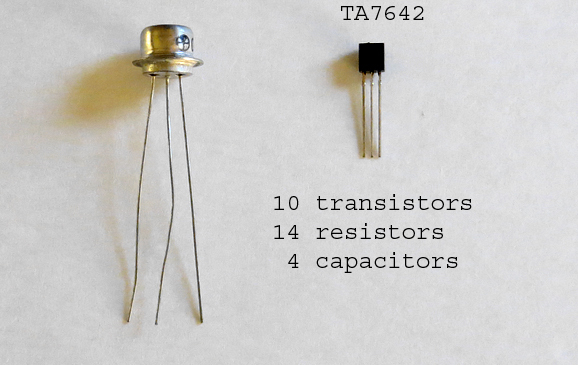 Germanium transistors are still cheap and easy to get on ebay (as of 2015). 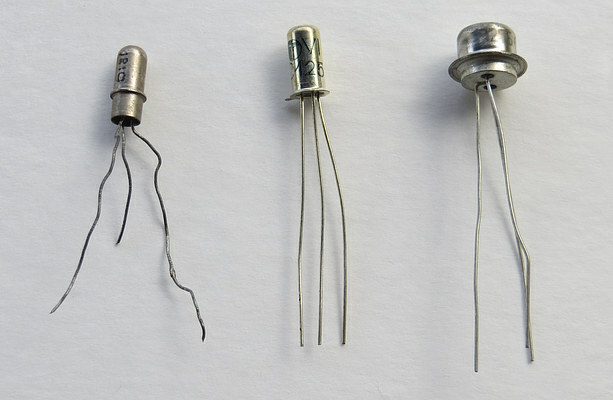 On the left is my original transistor from Ree Electronics, purchased in 1966. Next to it is a NOS TUNGSRAM AC125 from Bulgaria. Next is a CK722 / 2N107 generic equivalent. 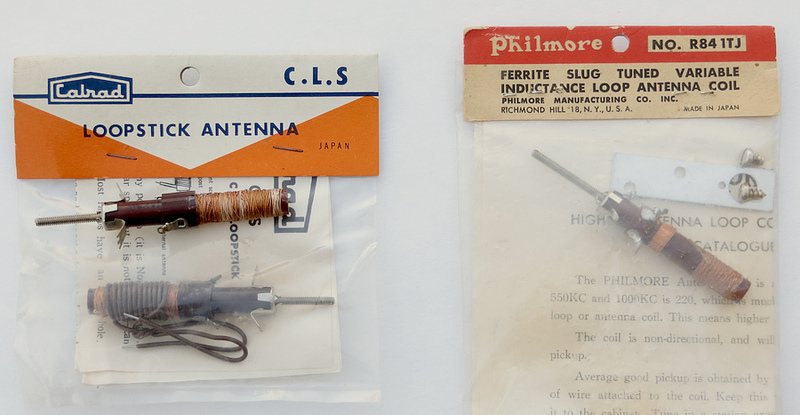 On the right is a transistor from Radio Shack, still in the package. It's so old I don't want to open it, so I just look at it. I almost bought this NOS CK722 but the price went up too high ($27). There is no guarantee it would work after all these years. Improving the set while keeping it "Morgan Style." 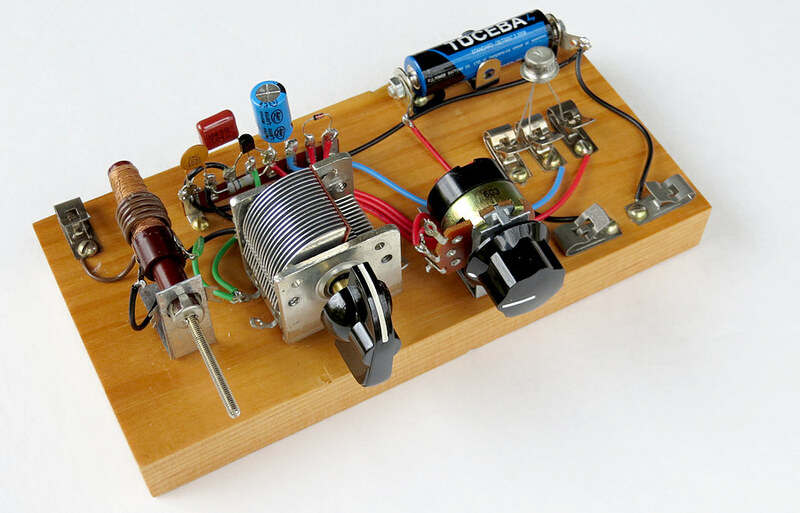 to use as an audio amplifier. 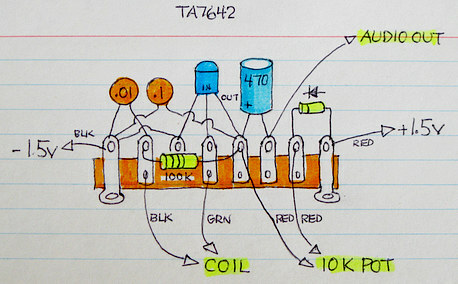 Here is the schematic. 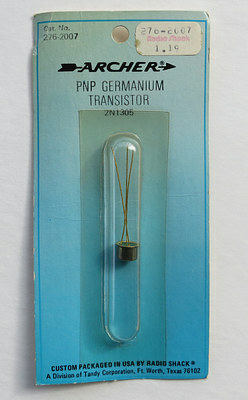 Notice you still need the headphones to turn on the Germanium transistor, just like in the Morgan set. 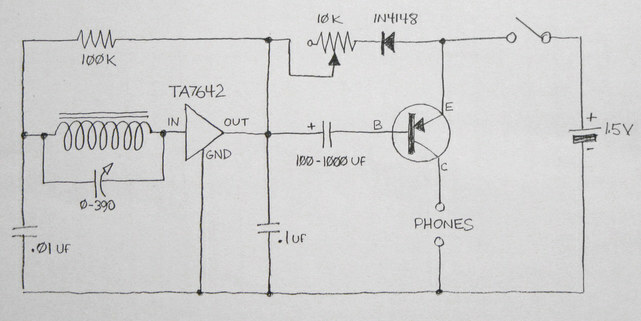 The 1N4148 diode and 10K pot are used to control the voltage to the TA7642, which needs about .9 volts DC. When the control is adjusted properly the radio will be loudest and most sensitive. To keep the design simple, the IC and its supporting components were put on a single terminal strip. A picture was drawn first to get a clear idea of how everything was to be wired. Then the terminal strip was screwed down and the wires were connected. So how is this an improvement? It doesn't need an external antenna or ground! It's portable! You can now listen to the radio in your automobile, take it to your campsite, and even use it while in a canoe. There is a Fahnestock clip to attach an external antenna if you want to use one. 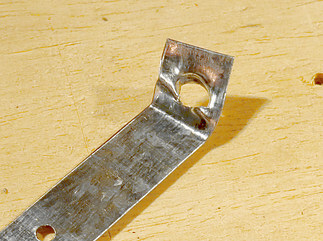 The clip is connected to a few turns of wire wrapped around the coil. The radio can get very loud with an external antenna. Mine got so loud I was worried about damage to my nearly-impossible-to-get headphones. Did you notice the knock-off TOSHIBA battery? My grandson Matt gave it to me. He said his mom bought 60 of them for five dollars at Zerns, a farmers market in Gilbertsville, PA. Six months later they had to go though the house finding every device with AA batteries in them, because they were all leaking. "Original" and "Improved" Morgan sets.